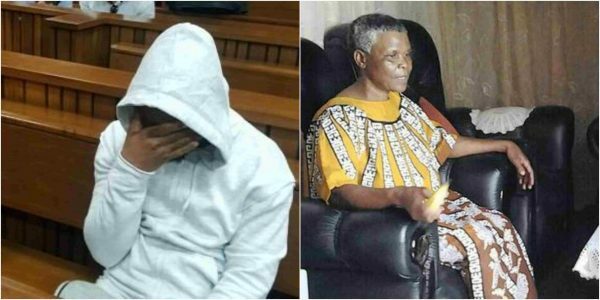 A South African man who stabbed his 73-year-old mother to death and then chopped up her body, claiming the voices in his head made him do it, has been declared a dangerous criminal and sentenced to indefinite imprisonment. Judge Cassim Sardiwalla on Friday sentenced Kitiji John Mathe, 40, to indefinite imprisonment for the gruesome April 2017 murder of his mother Makanana at their house in Mamelodi East. He ordered that Mathe must be brought before the court again after 25 years for the re-determination of his sentence. Mathe stabbed his mother in the neck and then mutilated her body by decapitating her, before removing all of her internal organs, her genitalia, severing both rib cages from the sternum and removing her wrists, ankles and right hand. He placed her body on her bed and her entrails in a bucket. “This is not human behaviour. It’s not even animal behaviour,” the Judge said. Mathe claimed he had a good relationship with his mother but was under stress from the voices in his head because of the effect of rat poison he drank in an attempt to kill himself, but a panel of experts found that he was not suffering from any mental illness and was fit to stand trial. When his sister Rosina asked him where their mother was because she could not reach her, he said she was cleaning the bathroom and could not come to the phone. When his cousin came to check on her, Mathe was busy mopping the floor and told her his mother had gone to visit a friend. When she could not find his mother she returned to the house, only to find it locked. Mathe’s sister eventually broke open the door and discovered her mother’s mutilated body on the bed. His sister, although clearly still traumatized by her mother’s gruesome murder at the hands of her own brother, testified that she had forgiven him. His cousin testified that Mathe and his mother had arguments and that she had often seen bruises on her aunt, who complained that her son was assaulting her, but refused to lay a charge because she loved him. Judge Sardiwalla said it was aggravating that Mathe’s mother had relied on her son for her welfare and safety. She had seen that he was not well that night and prepared food for him, only for him to murder her and chop up her body. He said Mathe had clearly planned the murder and knew exactly what he was doing. The method he used suggested that he possibly wanted to get rid of the body parts. “The accused attacked an elderly, vulnerable, unsuspecting woman who was his own mother. How much worse a crime can you find?” What is concerning is that he does not take full responsibility for his actions. This is an indication that he did not appreciate the gravity of his actions,” the Judge added. He said family murders, where women and children were invariably the victims, had become endemic in our society and should not be treated lightly. Many women and children live in constant fear of their lives and their right to dignity and security is flouted by senseless inhumane people like the accused, he added.